Okay so I’m not going to lie, before I start this review I’m going to admit that it might be slightly bias since I’m actually the founder of this system. But whilst it might be slightly bias (because I believe it is awesome), at least you can rest assured that you’ll be getting the full, in-depth truth about this system. So if you’ve came across Blog & Bank and you’re wondering what it’s all about then you’re definitely in the right place to find out. What is Blog & Bank? Blog & Bank is a system that I put all of my blood, sweat, tears (and money) into creating. I was fed up of seeing all of these “get rich quick” type systems which promise the world & deliver nothing so I decided to take it upon myself to create a free training program that gave people real, solid, actionable training in bitesize chunks delivered in an easy to understand manner. And on top of the training I also wanted to platform based on my own personal business model that people could use to take their income to a completely new level. 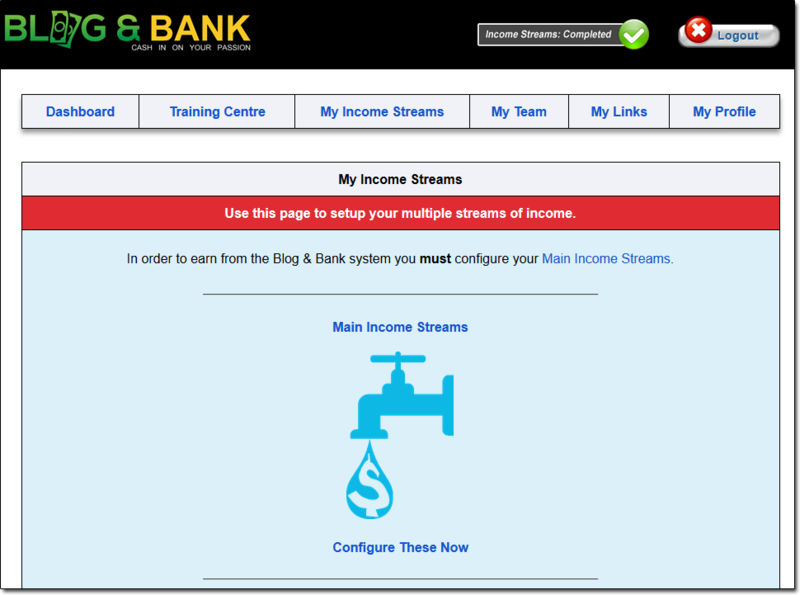 If you’ve never blogged before, Blog & Bank will show you step-by-step how you can start a blog & make money by blogging. It’s the worlds first system that walks you through the entire process, all the way from setting up your blog right through to making your first commissions. The training is available in both video & written format so you can pick which material works best for you depending on how you like to learn. The bottom line is that whether you have a blog or not, Blog & Bank is a system that will help you to either start, or grow your business. Best of all – it’s free. I created Blog & Bank with the intention of helping people to leverage the power of the internet through writing. Sure, I could have charged a fee for the training – but I’m not interested in holding people back from educating themselves, I wanted to release this system/training absolutely free of charge so that as many people as possible can learn how to start a blog & make money blogging, without any costs holding them back from getting involved. So getting started with Blog & Bank is absolutely free, and I’ll make 100% sure that remains the case – there will never be any costs to get involved, ever. When you join Blog & Bank there are two different routes you can take, and this depends whether or not you select that you’ve already got a blog during the signup process. If you select that you have already got a blog then we’ll assume that you already have a general know-how of things so you’ll be given instant access to all of the training & left to your own devices to decide what type of things you want to learn. If you select that you haven’t got a blog, then you’ll be taken step-by-step through the process of setting up your blog, configuring it, and learning how to make money by blogging. The reason I created it this way is because over the years I’ve been online I learned something important – and that’s that processes work. You see as a new blogger if you were given instant access to all of the training you’d absolutely no doubt suffer from information overload – you wouldn’t know where to start, and that’s been the big downfall of all the other similar systems/programs that have launched in the past. But by feeding you the information step-by-step and taken you through a proven process we can make absolutely certain that by the end of the training you have everything set-up as it should be, and that you are in a position to begin making money from your blog. 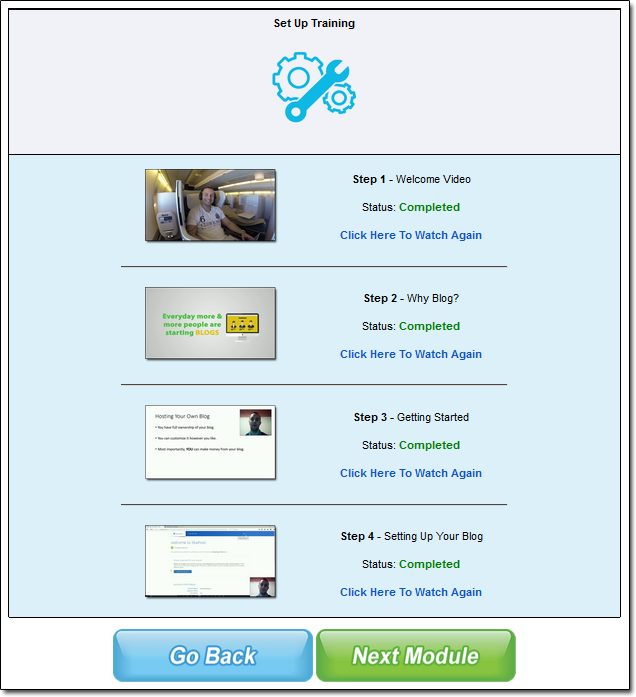 The training is all broken down into modules and steps, so it’s really easy to follow – and I made sure that I broke each step right down into bitesize chunks to prevent you suffering from information overload. I truly believe that even if today is the first day you’ve ever sat at a computer, Blog & Bank would still be able to walk you through the process of creating a blog & making money blogging. It really is “over the shoulder” style training that literally anybody can follow regardless of their knowledge or experience. So after completing the fundamental training you’ll be in a position where you’ll have your own blog & you’ll be ready to make money. You also get an “action plan” that will show you the things you should be doing & will help you towards obtaining speedy results. On top of that you’ll be able to enter into Blog & Bank’s Daily Blogging Challenge where you’ll have the chance to win $50 every single month. I understand that sometimes you can lose the motivation for keeping your blog up to date so on top of the training & opportunity provided by Blog & Bank I also wanted it to make blogging fun & build a real community spirit so everybody works together & keeps each other motivated. The Daily Blogging Challenge is just one of the ways we do this. Once you’ve got the fundamental training out the way you’ll then be given access to advanced training, where you’ll learn all sorts of different things such as how to rank your blog higher in search engines, how to become a social media guru & how you can take your income to the next level. I’ve incorporated these modules because I wanted to create a system that not only helps brand new bloggers, but one that helps veteran bloggers too. If you’ve heard about Blog & Bank then chances are you’ve heard about the opportunity attached too – and that’s because it’s amazing (even if I do say so myself). You see when a new learner comes into Blog & Bank they’re recommended some essential tools, such as a domain name & web hosting. Now it’s worth pointing out that Blog & Bank learners are only ever recommended tools if they’re either essential or will truly help them grow their business – one thing we are massively against is recommending things “for the sake of a commission”. But, here’s the awesome part – instead of Blog & Bank taking the commissions, the commissions are paid out to the members… and they’re paid out through a completely revolutionary compensation plan which combines the best bits of both the affiliate marketing world & the MLM world. You see we believe in team work – and as the saying goes – together everybody achieves more, which is totally true. So Blog & Bank has been built upon the power of team work, because as a team you can leverage each others efforts & build something much bigger than you could ever build on your own. And on top of making things bigger, a team makes things easier and most importantly – more sustainable. Once you’ve completed the fundamental training modules inside Blog & Bank, you’ll have the opportunity to add your affiliate links for the essential tools that we recommend during the learning process. This means that once you connect your Income Streams (aka your affiliate links) you’ll get the commissions paid directly to you when you bring a new member in & they go through the process. But when you bring in new members, we lock those members to you – and you pass up your 2nd, 4th and then every 10th member. So you’re 2nd, 4th & then every 10th members get passed up to your sponsor and your sponsor gets the commissions from those members. This initially might not sound too fantastic, but in just a moment you’ll see how it flips around and works massively in your favor. Because all the other members in between, i.e your 1st, 3rd, 5th, 6th, 7th etc are all locked to you. Not only do you get the commissions from these members, but when they go on to introduce people to Blog & Bank you also get their passups locked to you. So when they bring in their 2nd, 4th and then every 10th members, they’re all passed up to you – and they too all become locked to you. And because these passups have become locked to you, it means that not only will you earn commissions from those members but you’ll also get their passups too so the cycle continues. Essentially your team begins building your team, and at the same time your team is building your income. 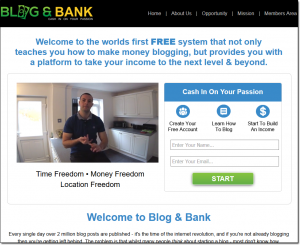 Let’s say you introduce 5 people to Blog & Bank. You keep 3, and you pass up 2 (your 2nd and 4th). Now these 6 members also bring in 5 members – which means you’ve gained an additional 12 members in your team (because they were locked to you so you also get their passups too). So from introducing just 5 people, you’ve already grown a team of 23 people – and it will only keep growing. Obviously that’s just an example, but hopefully you can see the power of this opportunity – and when you have the potential to earn over $65 per member along with residual commissions you can probably see how it can prove to be very lucrative indeed. In the example above that would mean you’d have made almost $1,500 from the efforts of your team – which is pretty crazy stuff. I tried to keep the Blog & Bank compensation plan super simple, but even still I know it can take a little bit of time to get your head around it – but the truth is all you really need to know is that it flat out works. I designed the platform around my own personal business model which I’ve been using to generate a full time income online for around 5 years now. It’s a proven model & I spent months testing, tweaking & perfecting it – at Blog & Bank you have the opportunity to use it yourself in your own business & you can rest assured that it works. As I say, I made Blog & Bank 100% free so the easiest way to discover the power of the compensation plan is to try it for yourself – even if you don’t fully understand it, get involved, try it out & watch what happens. I can almost guarantee that you’ll be amazed because it’s the first of it’s kind, and I know for sure that it will help you take your income to a whole new level. The reason I created this system & opportunity because I feel that the internet is extremely powerful, and it’s there to be leveraged – yet very few people are actually leveraging it & instead they’re leaving copious amounts of money on the table which could have been in their pockets with no extra effort. Blog & Bank ultimately makes it easy for people to leverage the internet – whereas previously you would have had to spend lots of money developing & tweaking a 6-figure sales funnel, Blog & Bank enables you to simply “plug-in” to one that’s already developed. That’s why I truly believe that anybody & everybody who takes advantage of the Blog & Bank opportunity will become very successful indeed, because team work works wonders. I would rather earn 1% off a 100 people’s efforts than 100% of my own efforts. I really hope you enjoyed my review, and I also really hope that you enjoy the Blog & Bank system itself. Please do feel free to leave a comment below if you have any suggestions on how you feel I could make it even better, and also feel free to ask any questions that you might have too… I’d be happy to help. Facebook On Fire – Scam Exposed? Read My Honest Review Before Joining!